SplitMetrics is a service which allows to conduct A/B testing for a page of an app on the App Store. 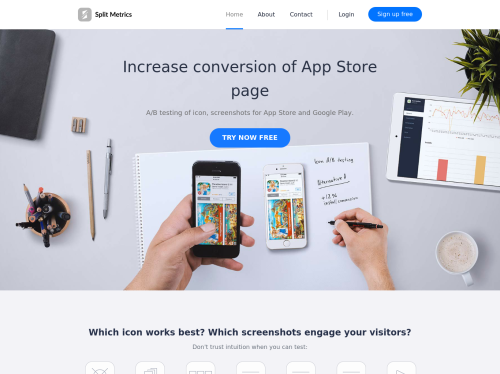 It allows to increase conversion of an app page by the means of optimiziation of screenshots, icons and other data of any app page. This optimization allows to increase of number of organic installs. It makes your advertisement and trafic purchase more profitable and saves your money. Using the service you can find out that for your target audience for example, a red icon and screenshots with an image of blonde lady on them works better than a green icon and brunette lady on them. In 5 minutes every person without any programming skills can launch experiments and test changes in: - Screenshots - App icon - Description - Name - App video preview - etc.